Healthcare interest groups spent tens of millions of dollars cutting deals with the Obama administration and Congress in 2009 and 2010. The Supreme Court may soon leave those deals in tatters—and saddle the healthcare industry with multi-billion dollar losses. Industry insiders have been following the first two days of the high court’s consideration of the law, but the debate over severability may be the most important yet for the interests of pharmaceutical and healthcare giants. If the court rules that the individual mandate, which requires every American to purchase health insurance or pay a costly "tax penalty," is unconstitutional, it can still choose to uphold the remainder of the law. But that would be an expensive decision for drug companies, according to business intelligence firm Global Data, which estimates that "the pharmaceutical industry … may lose out on $115 billion in additional revenue over the next decade if the law is overturned." Industry lobbying group PHRMA spent $32 million negotiating with lawmakers for a deal favorable to drug companies. The group agreed to $80 billion in price controls after months of exchanges with the administration. 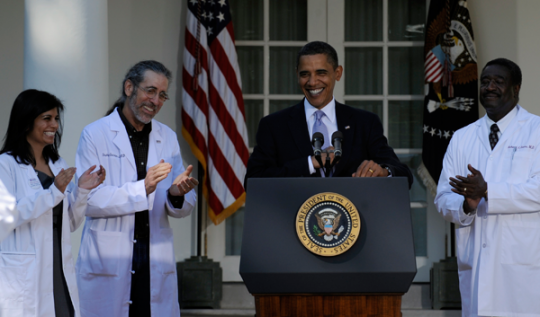 Obama used the individual mandate as a selling point for the pharmaceutical industry, arguing that more insured individuals would translate into a larger market of customers. If the court severs the mandate, however, companies would still have to abide by the price controls while receiving little in the pledged market growth. "These concessions are already written into the bill; they are part of the law," said Dr. Jerry Isaacson, the report’s author. "The price controls will become stricter, but the industry will lose out on 30 million new (customers) if the mandate is unconstitutional." But that pales in comparison to the risks hospitals face, according to Edmund Haislmaier, a Heritage Foundation healthcare scholar. "The bottom line is the [30 million new insured] are younger; they’re not big drug users," Haislmaier said. "Hospitals are going to be hit hardest by this." Hospital interest groups agreed to multi-billion cuts—$10.6 billion in 2018 and 2019 in Disproportionate Share Hospital adjustment payments alone—after receiving assurances that the individual mandate would cut down on uninsured hospital stays, which cost hospitals $16 billion in 2008. These same groups, which spent nearly $30 million lobbying for the bill, would now have to endure the cuts while shouldering the financial burden of uninsured stays. The American Hospital Association, along with five other major hospital associations, filed an amicus brief in support of the law, citing its own dealings with lawmakers. "[The bill’s language] is concrete evidence of Congress’ intent to tie DSH cuts to the higher percentage of insured patients, and reduced un-compensated-care burden, that the individual mandate would bring," the brief states. "But without the mandate, Congress’s careful balance would be undone." The brief reinforces Haislmaier’s view that blatant self-interest guided Obamacare negotiations. "It’s incredibly self-serving," he said. "What they’re saying is, ‘hey, we agreed to these cuts because you promised all this extra coverage.’"
The Heritage Foundation has been credited with introducing the concept of the individual mandate during the debate over Hillary Clinton’s healthcare reform almost 20 years ago, but has since come to oppose it. It is not the only group that has changed sides on the issue: Obama slammed then-rival Hillary Clinton over the mandate on the campaign trail. "We still don’t know how Sen. Clinton intends to enforce a mandate … you can have a situation, which we are seeing right now in the state of Massachusetts, where people are being fined for not having purchased health care but choose to accept the fine because they still can’t afford it, even with the subsidies," Obama said. "They are then worse off: They then have no health care, and are paying a fine above and beyond that." The mandate helped Obama win favor among the healthcare industry, which donated $2.3 million to his 2008 campaign. His fundraising among the healthcare industry has not slowed in 2012, with Obama raking in more than $360,000 from drug makers. The court will hear arguments concerning severability on Wednesday morning and is expected to issue a ruling in June. This entry was posted in Issues and tagged Cronyism, Obama Administration, Obamacare. Bookmark the permalink.